Is your business looking to step-it-up on its branding when presenting your fried food appetizers or fried menu items? Does your business need a coated greaseproof paper that can stand the test of time of grease leakage? Does your logo get lost in oil and grease spots that soak through because your presentation uses non-absorbent paper? If this is the mistake your branding is running into, then call Gator Paper today to add your logo to a custom printed greaseproof paper that is impermeable to oil or grease? Gator Paper offers a hi-quality dependable custom printed greaseproof paper that is second to none with a protective barrier on the paper that prevents grease from soaking through it. Fried foods can present a severe challenge for any business or restaurant owner looking to keep flavor in and decrease the not so appealing visual of grease seeping through, so feel confident that purchasing our custom printed greaseproof paper is called greaseproof for a reason. Our custom printed Greaseproof Paper is perfect for fish & chip baskets, as nacho tray liners, hot food wraps, cold food wraps or even fry cones. 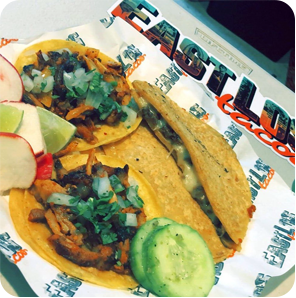 Aside from our 4 color printing process, our greaseproof paper has never been so accessible or affordable! Not only do we offer greaseproof Paper for all types of fried foods, but we also offer custom printed Fry Scoop Cups. These are a more sturdy fry container to hold all of your fried food. Custom printed Greaseproof Paper is a unique way to brand your delicious fried food creations! What is the minimum order requirement for custom printed Greaseproof Paper? Custom printed Fry Paper has a 1 case minimum = 1,000 sheets, Storage space won’t be an issue with short runs like this! What is the lead time for custom printed Greaseproof Paper orders? Standard lead times for all custom printed Greaseproof Paper orders is 2-3 weeks. Sometimes rush orders can be accommodated. Am I restricted to a small list of standard Greaseproof Paper sheet sizes? No! While we do offer a list of standard Greaseproof Paper sheet sizes to help keep your overall project costs down, we can also custom cut your sheet size to any desired width and length needed to fit your application. Am I limited to 1 and 2 color prints? NO! 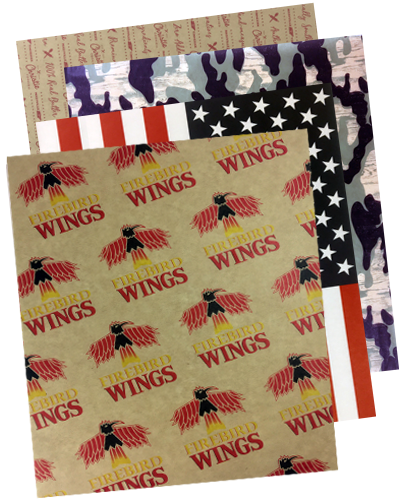 Our greaseproof paper can be printed in 1 color, 2 color or 4 color process printing with full ink coverage. We can also run standard step & repeat prints or registered/spot prints. Our talented design team will provide all the help necessary to solve any artwork challenge. All artwork submitted to Gator Paper must be a Vector art file. Adobe Illustrator, EPS, and high-resolution PDF files are preferred. If the line artwork is simple enough, sometimes a JPEG file will work. Bitmap images are not good enough quality for proof or plate making and are not accepted. Need a price quote on custom printed Greaseproof Paper? Contact us today!Contact us today! If you like our line of custom printed Greaseproof Paper, then you need to check out our custom printed French Fry Bags!